Reddam Racing’s likely Kentucky Derby Presented by Yum! Brands (GI) favorite Nyquist got his first feel for Churchill Downs Sunday morning at 8:30 when he jogged once around the big oval under exercise rider Jonny Garcia. He appeared to handle it just the way he’s handled everything else in his brief career – with a winning style. Trainer Doug O’Neill’s champion-2-year-old-turned-blossoming-sophomore-star went trackside with a pony steered by assistant trainer Jack Sisterson, passing through the six-furlong gap and on about his business on a sloppy and sealed strip as easy as can be. He finished up in short order and headed right back to Barn 41, which will be his home through at least next Sunday. “He jogged today and he’ll jog tomorrow,” said O’Neill, who besides Nyquist has nine other Thoroughbreds and a pony ensconced on the Churchill backstretch. The trainer also has brought Reddam Racing’s Land Over Sea for Friday’s Longines Kentucky Oaks (GI) and has six additional stakes picked out this coming week for six of his other runners. O’Neill said owner Paul Reddam would be in from California on Wednesday. “He wants to be here for the Derby draw Wednesday night,” he said. BRODY’S CAUSE/CHERRY WINE – Trainer Dale Romans reported that his two Kentucky Derby hopefuls, Brody’s Cause and Cherry Wine, exited their five-furlong breezes Saturday morning in good order. Both horses walked the shedrow Sunday morning and are scheduled to jog on the main track Monday. CREATOR/GUN RUNNER – WinStar Farm's Creator and Winchell Thoroughbreds and Three Chimneys Farms’ Gun Runner galloped a mile and half Sunday morning after the renovation break for trainer Steve Asmussen. Exercise rider Carlos Rosas was on Gun Runner, and exercise rider Abel Flores was on Creator. DANZING CANDY – Trainer Cliff Sise Jr. reported that Danzing Candy exited his five-furlong work on Saturday at San Luis Rey Downs training center in good order and walked the shedrow Sunday morning. Halo Farms, Jim and Dianne Bashor’s Danzing Candy is scheduled to arrive at Churchill Downs on Monday afternoon after catching an early morning flight out of Southern California. Sise, who will travel commercially, also is expected to arrive in Louisville on Monday afternoon. Danzing Candy will get acquainted with the Churchill surface Tuesday, Sise reported. DAZZLING GEM – Trainer Brad Cox reported that Dazzling Gem came out of his five-furlong workout of 1:00.40 in good order and that he just walked Sunday morning. The Misremembered colt is 24th on the list of potential Kentucky Derby starters and would need several defections to make the field. DESTIN/OUTWORK – There wasn’t much shaking on the schedule for trainer Todd Pletcher’s Derby duo of Destin and Outwork Sunday morning, other than an amble around the shedrow on Barn 40. Both colts had worked Friday morning, then jogged Saturday and – in the conditioner’s usual pattern – this was their “off” day. Destin had accomplished his five-furlong drill in 1:01.20, while Outwork had gone in 1:01 two days ago. Both appeared to be taking their steps toward Derby 142 in smooth and steady fashion. DISCREETNESS – Xpress Thoroughbreds’ Discreetness, 26th on the Kentucky Derby leaderboard, walked the shedrow at trainer Jinks Fires’ barn. Should Discreetness make the Derby field, he would be ridden by 55-year-old Jon Court. Court started the Spring Meet in rousing fashion Saturday night, winning the first two races on the program. The two victories boosted Court’s Churchill Downs’ win total to 498 and his career total to 3,965. EXAGGERATOR – It was a very quiet Sunday morning at the Keith Desormeaux barn, as almost all of them are. The trainer had worked his Derby colt Exaggerator on Saturday (1:02.60) and walking was in order on a pretty morning in Louisville. The native of Louisiana Cajun country has established a Sunday routine at his stable that has been in place since he became the boss and hung out his own training shingle. Barring something extraordinary, it is always a day off, or a day of rest, for all concerned. “When I first started doing this on my own,” he said, “I said why does this have to be a seven-day-a-week job? I understand that it is a seven-day-a-week responsibility, that these animals have to be fed and cared for every day and, of course, we do that. But that doesn’t mean that they – or we – have to work seven days. “My horses are given every Sunday off. So is my help. I like to go to church on Sunday and there’s time for that. Some of my help does, too. It is a routine now at the stable and it works well for all of us. FELLOWSHIP – Jack of Better Farm’s Fellowship, No. 21 on the Kentucky Derby leaderboard, was an early bird Sunday at Churchill Downs. The colt jogged on the main track in the first set at 5:45 a.m. with exercise rider Brian O’Leary aboard. LANI – Koji Maeda’s Lani paid a visit to the starting gate near the conclusion of his 35 minutes on the track Sunday morning. With exercise rider Eishu Maruuchi aboard, Lani came on the track shortly after 8:30 during the training time reserved for Kentucky Derby and Kentucky Oaks contenders. Lani made four circuits of the track, a combined walk and jog for the first lap, jogging the second, galloping a mile and a half and then walking to the starting gate for his schooling session. Lani’s extended time on the track is nothing new for him. Trainer Mikio Matsunaga is scheduled to arrive in Louisville on Monday and jockey Yutaka Take on Friday. Take had flown in from Japan to work Lani on Wednesday and returned to Japan the next day. Take got the week off to a good start early Sunday when he won the Emperor’s Prize (GI) at Kyoto on Kitesan Black. MAJESTO – Grupo 7C Racing Stable’s Majesto jogged in the mile chute and then galloped a mile and a quarter under exercise rider J.J. Delgado before the morning renovation break. Runner-up in the Florida Derby (GI) in his most recent start, Majesto still is in need of a rider for the Derby. “I wanted to get (Javier) Castellano,” trainer Gustavo Delgaro said of the rider who was aboard Majesto in his past two starts but who is committed to ride Destin for Todd Pletcher in the Derby. MOHAYMEN – Shadwell Stable’s Mohaymen had his second walk day following a half-mile work on Friday. Junior Alvarado, who has ridden Mohaymen in all six of his starts with five victories, has the Derby mount. MOR SPIRIT – Hall of Fame trainer Bob Baffert, who had flown back to California following Mor Spirit's work last Tuesday, arrived back in Louisville late Saturday night and was on hand to watch his charge gallop 1 ½ miles under regular exercise rider George Alvarez during the special 8:30 a.m. training time. The Santa Anita Derby (GI) runner-up is expected to have his final workout Monday morning. It has been 20 years since Baffert saddled his first Kentucky Derby runner and nearly pulled off the upset when Cavonnier finished second by a slim margin. Since that time he has won four Derbys, including last year with the heavily favored American Pharoah, who went on to become the sport's first Triple Crown winner in 37 years. Baffert is feeling a lot less pressure this time around. “We're just the opening act this year,” quipped Baffert, as he visited with several members of the media Sunday morning. MO TOM – G M B Racing's Mo Tom, with exercise rider Mario Garcia aboard, galloped about a mile-and-a-quarter Sunday after the renovation break. The colt also schooled at the starting gate. Mo Tom, trained by Tom Amoss, will be racing for the first time since finishing fourth, with a troubled trip, in the Louisiana Derby (GII). Amoss said he has no concerns about the six-week spacing between Mo Tom's final prep race and the Kentucky Derby. Since 1929, two Kentucky Derby winners – Animal Kingdom in 2011 and Needles in 1956 – were racing for the first time in six weeks. Also, Amoss is confident that Derby Day hoopla, which has bothered many horses over the years, will be a non-factor for Mo Tom. MY MAN SAM/SHAGAF – The Chad Brown-trained duo of Sheep Pond Partners, Newport Stables and Jay W. Bligh’s My Man Sam and Shadwell Stable’s Shagaf each jogged one mile at 8:30 a.m., their first day back to the track after timed workouts Friday. Even though there are several more accomplished horses in the field – and Brown even acknowledges this upcoming quote is a Derby cliché – the trainer insists he “wouldn’t trade these two for anyone else in the field” in light of how they’re coming up to the race. My Man Sam finished an impressive second in the Blue Grass Stakes (GI) breaking from the outside post 14 and having to circle the field eight-wide into the stretch. His previous efforts and his disposition gives Brown reason to believe that jockey Irad Ortiz Jr. will have the valuable option of leading My Man Sam wherever he finds daylight, whether it’s between horses or up the rail. The talent and tenacity displayed by My Man Sam emerged as a bit of a surprise to Brown, who was frustrated by the colt’s lack of focus when he first came to the barn as a 2-year-old. “I thought he’d be a nice horse but I never thought he’d be a Derby-caliber horse,” Brown said. “He got a late start for mental reasons. He was very unfocused in the summer. Originally he was sent to me as a turf prospect. I breezed him on the turf at Saratoga and I didn’t like the horse on the turf. So we just stuck to the dirt and gave him some time. “It took him a long time to get his gate card and stuff like that. He just wasn’t all there. But he put it all together late in the fall and had some good workouts that led us to believe this horse was going to be OK. The emergence of My Man Sam as a serious 3-year-old stands in stark contrast to his stablemate, Shagaf, who inspired Derby dreams from his debut, a six-length win at Aqueduct. Chief among those excuses was a muddy track in New York for the Wood Memorial (GI), which resulted in a lackluster fifth as the favorite. Shagaf uncharacteristically dropped back almost immediately and made only a minor move into contention without ever seriously threatening the winner, Outwork. The effort was especially disappointing because Brown had seen improvement in Shagaf after his winning effort in the Gotham (GIII), a trend that has continued since arriving in Louisville. “I’m not sure this horse liked Florida,” he said. “He just never was quite the same down there as he was in New York. After the Gotham we left him in New York and the horse really started to pick up his weight again and he just started to train more consistently. He was really coming into the Wood in fine shape before it rained. Since the Wood there’s been more improvement, more consistency; he’s gaining weight, getting stronger. The horse breezes by himself now; he was always one that needed company. He’s had two fabulous works here at Churchill, by himself, effortlessly. OSCAR NOMINATED – Ken and Sarah Ramsey’s Oscar Nominated, winner of the Spiral Stakes (GIII) at Turfway Park in April, jogged 1 1/2 miles shortly after 6 a.m. at the Trackside Training Center. Trainer Mike Maker said the Kitten’s Joy colt came out of his timed work Friday in good order and that he was pleased with how well his charge had taken to the Churchill Downs surface in advance of his first start on dirt. “If he doesn’t win I don’t think the surface will be an excuse, just the competition,” he said. Oscar Nominated made his first six starts on turf, including a win in the $50,000 Black Gold Stakes at Fair Grounds, before taking the Spiral at 23-1 over Turfway’s synthetic Polytrack. Maker and the Ramseys have teamed up with two previous Derby starters by Kitten’s Joy – Dean’s Kitten (14th in 2010) and Derby Kitten (13th in 2011). Another Ramsey starter by their prize stallion, Charming Kitten (ninth in 2013), was trained by Todd Pletcher. SUDDENBREAKINGNEWS – Samuel F. Henderson's Suddenbreakingnews had an easy first day back to the track following his five-furlong workout Friday. Under exercise rider Ramiro Gorostieta, the Mineshaft gelding jogged a mile and visited the paddock after the renovation break. Prior to starting his morning exercise, the Southwest Stakes (GIII) winner stood patiently for several minutes and appeared nice and calm as he watched the other horses on the track. Von Hemel thinks Suddenbreakingnews' mind will be one of his advantages as the crowds and excitement build each day leading up to the Kentucky Derby. TOM’S READY – G M B Racing's Tom's Ready, exercise rider Emerson Chavez aboard, jogged a mile Sunday before the renovation break for trainer Dallas Stewart. The colt also schooled in the paddock. Stewart, who will be participating in his fifth Kentucky Derby, finished second twice with longshots – Golden Soul in 2013 and Commanding Curve in 2014. Tom's Ready, who was a 30-1 shot in the Louisiana Derby, will be a longshot Saturday, but that doesn't matter to Stewart. "We're going for the win.'' he said. "We're not here to participate. We're going for the money. This is the situation. I'm trying to win it, and if he's good enough, he'll win it, because he's ready. So forget all about this 'Let's just be in the damn race.' That's not what I'm all about. TROJAN NATION – The Street Cry colt Trojan Nation, who will be known as “The Maiden” when he comes to Kentucky this week to run in Derby 142, galloped a mile and one half for trainer Paddy Gallagher at his Santa Anita headquarters Sunday morning. In six career starts thus far, the bay has gotten close several times but has yet to have a picture taken, thus the moniker. While more than a few non-winners have tried their luck over the years at the mile and a quarter of the race usually filled with high achievers, only three who never have rung the bell beforehand have finished first – and that most recent time it happened was 83 years ago. But that will not hinder the good, old college try with the colt from owners Julie Gilbert and Aaron Sones, trainer Gallagher and rider Aaron Gryder come Saturday with the chance to become rich and famous all in one fell two-minute swoop. Trojan Nation will be airlifted from Los Angeles to Louisville Monday with exercise rider and right-hand man Andy Durnin following in transit. Gallagher has a flight lined up for Tuesday. WHITMORE – When asked to describe Whitmore Sunday morning, trainer Ron Moquett had just one word “happy.” The Arkansas Derby (GI) third-place finisher looked even happier after he jogged one mile and galloped one mile during the special 8:30 a.m. training time under Laura Moquett, wife of the trainer. CARINA MIA – Three Chimneys Farm’s Carina Mia, 17th on the Kentucky Oaks leaderboard, galloped after the renovation break under exercise rider Penny Gardiner for trainer Bill Mott. The filly is scheduled to work Monday morning, Mott indicated. “We have until Tuesday to make a choice,” Mott said of whether to enter the Oaks and hope for defections, or enter Friday’s $200,000 Eight Belles (GII). CATHRYN SOPHIA – Cathryn Sophia's trainer John Servis reported by text that the daughter of Street Boss was scheduled to leave Keeneland by van for Churchill Downs at approximately 11:15 a.m. today. Cash is King's Cathryn Sophia, winner of her first four starts before finishing third in the Central Bank Ashland (GI) on April 9 at Keeneland, is expected to arrive at Churchill Downs around 1 this afternoon and be housed in Barn 43. DOTHRAKI QUEEN – Magdalena Racing’s Dothraki Queen, 16th on the Oaks leaderboard, had a walk day at trainer Kenny McPeek’s barn. DREAM DANCE – Stoneway Farm’s Dream Dance jogged 1 1/8 miles under exercise rider Joel Dominguez before the renovation break. Trainer Neil Howard, who saddled 2000 Kentucky Oaks winner Secret Status, picked up his 301st Churchill Downs victory Saturday night when Tanzen won the sixth race. GO MAGGIE GO – Mike Tarp’s Gulfstream Park Oaks (GII) winner Go Maggie Go jogged two miles on the Churchill Downs main track with exercise rider Tammy Fox in the irons after the renovation break for trainer Dale Romans. LAND OVER SEA – The Fair Grounds Oaks (GII) winner Land Over Sea took an easy tour of the Churchill Downs oval Sunday morning at approximately 9 o’clock with exercise rider Jonny Garcia aboard. It was her first sample of the historic Louisville track and – though the strip was sloppy and had been sealed in advance of the morning activity – she paid no attention to it. Trainer Doug O’Neill – who Saturday will saddle the Kentucky Derby favorite in Nyquist – will give rider Mario Gutierrez a leg up on Land Over Sea Friday when she goes for glory in the $1,000,000 Oaks. The Churchill Downs race will mark the sixth track the daughter of Bellamy Road has tested in what will be her ninth career start. She’s been out of the money only once so far for owner Paul Reddam and appears likely to be among the favorites for the Run for the Lilies. LEWIS BAY – Alpha Delta Stables’ Lewis Bay, convincing winner of the Gazelle Stakes (GII) at Aqueduct last month, jogged one mile at about 7 a.m. When Brown hangs out on the outside rail in the mornings he follows more than just his own charges, especially on days leading up to big events such as the Derby or Breeders’ Cup. MARQUEE MISS – Trainer Ingrid Mason, aboard her stable pony, escorted multiple stakes winner Marquee Miss to the track for the first time since a Friday workout for an easy one-mile gallop. The filly, who is sitting at No. 18 on the Kentucky Oaks leaderboard, is more likely to make her next start in the Eight Belles Stakes (GII) on the same Friday card. MO D’AMOUR/RACHEL’S VALENTINA – Trainer Todd Pletcher’s duo of Rachel’s Valentina and Mo d’Amour continued on their path to Friday’s $1 million Kentucky Oaks (GI) with simple one-mile jogs Sunday morning at Churchill Downs. Both fillies were dressed out in their pink saddle cloths and their white bridles for their leg-stretching during the special 15-minute session starting at 8:30 that is reserved for the Oaks and Kentucky Derby horses. Rachel’s Valentina had her regular exercise rider – Amy Mullen – attached for the exercise, while Mo d’Amour was partnered by Hector Ramos. The bred-in-the-purple Rachel’s Valentina – she’s by top sire Bernardini out of champion and recent Hall of Fame inductee Rachel Alexandra – will be among the favorites for the nine-furlong testing that normally points out the best 3-year-old filly in the land. John Velazquez rides Rachel’s Valentina, while Joel Rosario has the call on Mo d’Amour. MOKAT – JK Racing Stable’s Mokat jogged one mile and galloped 1 1/4 miles under Martin Ruiz during the 15-minute Oaks and Derby training session. Flavien Prat, the second-leading rider at Santa Anita Park’s winter meet, will be aboard Mokat for the third straight time. Baltas likes that Pratt understands the filly’s preferred style and blamed a misjudged ride for her only off-the-board finish in four starts this year. “She can’t run up close,” the trainer said. “She wants to get her feet underneath her and then she makes her run. Her one bad race the jockey moved to soon on her. He thought there was no speed in the race and he put her on the lead and that just didn’t work. Flavien knows her and I like the way he rides her. He knows she can’t be up in it from the beginning. 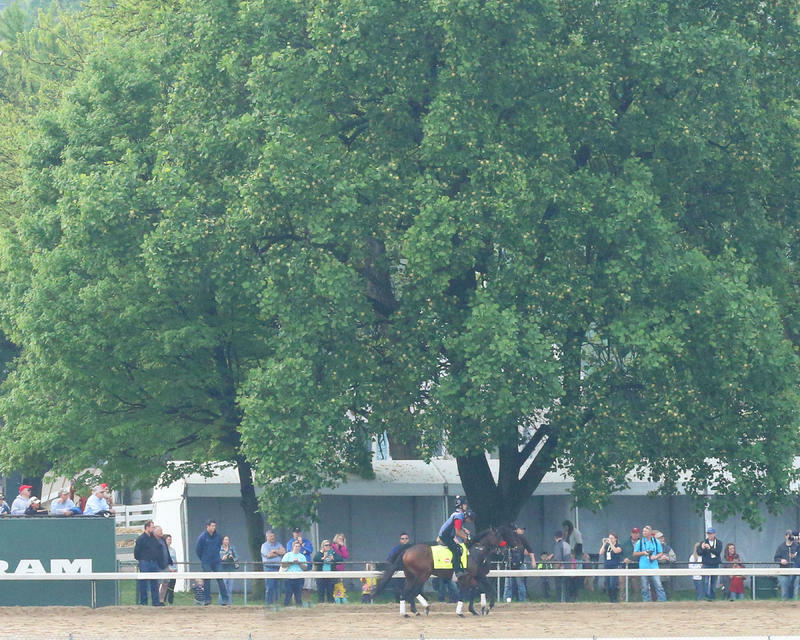 NICKNAME/ROYAL OBSESSION/TAXABLE/TERRA PROMESSA – Trainer Steve Asmussen's Kentucky Oaks hopefuls galloped a mile-and-a-half Sunday before the renovation break. Exercise rider Carlos Rosas was aboard LNJ Foxwoods' Nickname and Stonestreet Stables’ Royal Obsession. Exercise rider Abel Flores was on Stonestreet's Terra Promessa and Winchell Thoroughbreds' Taxable. The fillies will have half-mile workouts Monday, Asmussen said. PAOLA QUEEN – Grupo 7C Racing Stable’s Paola Queen galloped a mile and a half under exercise rider J.J. Delgado before 7 o’clock over a sloppy track. Runner-up in the Gulfstream Park Oaks (GII) in her most recent start, Paola Queen is 15th on the Oaks leaderboard. No rider has been confirmed for the daughter of Flatter. VENUS VALENTINE – Rosemont Farm's Venus Valentine galloped a mile and a half Sunday morning under exercise rider Maurice Sanchez for trainer Tom Amoss. The filly will school in the starting gate Monday, Amoss said. Shaun Bridgmohan, who rode Venus Valentine in an allowance/optional claiming race on turf in January at Fair Grounds, has picked up the mount for the Oaks. Corey Lanerie rode her in her past two starts – a fifth-place finish in the Fair Grounds Oaks (GII) and a victory in the Rachel Alexandra (GII). But Lanerie, who won the Central Bank Ashland (G1) on Weep No More, will be riding that filly in the Kentucky Oaks. WEEP NO MORE – Ashbrook Farm’s Weep No More walked the shedrow at trainer Rusty Arnold’s barn a day after working a half-mile in :49.60. $2 MILLION KENTUCKY DERBY PRESENTED BY YUM! BRANDS (GI) (Entries taken Wednesday, race Saturday, May 7) – Probable (in order of preference): Gun Runner (ridden by Florent Geroux, trained by Steve Asmussen, Barn 38); Nyquist (Mario Gutierrez, Doug O’Neill, Barn 41); Exaggerator (Kent Desormeaux, Keith Desormeaux, Barn 25); Outwork (John Velazquez, Todd Pletcher, Barn 40); Brody’s Cause (Luis Saez, Dale Romans, Barn 4); Creator (Ricardo Santana Jr., Steve Asmussen, Barn 38); Lani (Yutaka Take, Mikio Matsunaga, Barn 17); Mor Spirit (Gary Stevens, Bob Baffert, Barn 33); Mohaymen (Junior Alvarado, Kiaran McLaughlin, Barn 42); Danzing Candy (Mike Smith, Cliff Sise Jr., arrives Monday, Barn 41); Destin (Javier Castellano, Todd Pletcher, Barn 40); Suddenbreakingnews (Luis Quinonez, Donnie Von Hemel, Barn 22); Oscar Nominated (Julien Leparoux, Mike Maker, Barn 27); Shagaf (Joel Rosario, Chad Brown, Barn 42); Whitmore (Victor Espinoza, Ron Moquett, Barn 10A); Tom’s Ready (Brian Hernandez Jr., Dallas Stewart, Barn 48); My Man Sam (Irad Ortiz Jr., Chad Brown, Barn 42); Majesto (TBA, Gustavo Delgado, Barn 43); Trojan Nation (Aaron Gryder, Paddy Gallagher, arrives Monday, Barn 41) and Mo Tom (Corey Lanerie, Tom Amoss, Barn 29). Possible: Fellowship (TBA, Mark Casse, Barn 36); Adventist (TBA, Leah Gyarmati, Belmont Park); Laboan (TBA, Eric Guillot, Keeneland); Dazzling Gem (TBA, Brad Cox, Barn 9); Cherry Wine (TBA, Dale Romans, Barn 4) and Discreetness (Jon Court, Jinks Fires, Barn 40). CLICK HERE to view Brisnet Past Performances for contenders for Kentucky Derby 142. $1 MILLION LONGINES KENTUCKY OAKS (GI) (Entries taken Tuesday, race Friday, May 6) – Probable (in order of preference): Terra Promessa (TBA, Steve Asmussen, Barn 38); Lewis Bay (Irad Ortiz Jr., Chad Brown, Barn 42); Land Over Sea (Mario Gutierrez, Doug O’Neill, Barn 41); Weep No More (Corey Lanerie, Rusty Arnold, Barn 28); Go Maggie Go (Luis Saez, Dale Romans, Barn 4); Cathryn Sophia (Javier Castellano, John Servis, arrives from Keeneland Sunday); Mo d’Amour (TBA, Todd Pletcher, Barn 40); Venus Valentine (Shaun Bridgmohan, Tom Amoss, Barn 29); Mokat (Flavien Prat, Richard Baltas, Barn 43); Rachel’s Valentina (John Velazquez, Todd Pletcher, Barn 40); Royal Obsession (TBA. Steve Asmussen, Barn 38); Dream Dance (Brian Hernandez Jr., Neil Howard, Barn 25); Nickname (TBA, Steve Asmussen, Barn 38) and Taxable (TBA, Steve Asmussen, Barn 38). Possible: Paola Queen (TBA, Gustavo Delgado, Barn 43); Dothraki Queen (TBA, Kenny McPeek, Barn 6); Carina Mia (TBA, Bill Mott, Barn 19); Marquee Miss (Channing Hill, Ingrid Mason, Barn 15). $400,000 ALYSHEBA (GII) (Entries taken Tuesday, race Friday) – Probable: Cat Burglar, Coin Broker, Departing, La Macchina, Looks to Spare, Majestic Affair, Natchez, Noble Bird, Regally Ready. Possible: Blue Tone, Eagle. $300,000 LA TROIENNE (GI) (Entries taken Tuesday, race Friday) – Probable: Angela Renee, Curalina, Penwith, Sheer Drama. $200,000 EIGHT BELLES (GII) (Entries taken Tuesday, race Friday) – Probable: Blast, Blip n’ Th Bye, Durango, Frozen Hannah, Put Da Blame On Me, Stageplay. Possible: Cash Back. $150,000 EDGEWOOD (GIII) (Entries taken Tuesday, race Friday) – Probable: Adore, Believe in Bertie, Catch a Glimpse, Dothraki Queen, Enjoy Yourself (GB), Harmonize, Jeremy’s Legacy (IRE), Nodiac (IRE), Outsider Art, Sky My Sky. Possible: Ava’s Kitten. $150,000 TWIN SPIRES TURF SPRINT (GIII) (Entries taken Tuesday, race Friday) – Probable: Billy Two Hats, Guns Loaded, Latent Revenge, Mongol Bull, Something Extra, Speightsong. Possible: Alsvid, Power Alert (AUS). $500,000 WOODFORD RESERVE TURF CLASSIC (GI) (Entries taken Wednesday, race Saturday) – Probable: Big Blue Kitten, Bolo, Chocolate Ride, Danish Dynaformer, Divisidero, Finnegans Wake, Grand Arch, Reporting Star, Roman Approval, Tourist, World Approval. Possible: Tepin. $300,000 HUMANA DISTAFF (GI) (Entries taken Wednesday, race Saturday) – Probable: Dancing House, Kathbalu, Sarah Sis, Spelling Again, Stonetastic, Taris, Wavell Avenue. $500,000 CHURCHILL DOWNS (GII) (Entries taken Wednesday, race Saturday) – Probable: Barbados, Calculator, Holy Boss, Kobe’s Back, Limousine Liberal, Salutos Amigos, Squadron A. $300,000 CHURCHILL DISTAFF TURF MILE (GII) (Entries taken Wednesday, race Saturday) – Probable: Bureau de Change, Cash Control, Celestine, Isabella Sings, Josdesanimaux, Mississippi Delta, Rainha Da Bateria, Super Saks, Zipessa. Possible: Tepin. $300,000 AMERICAN TURF (GII) (Entries taken Wednesday, race Saturday) – Probable: Airoforce, American Patriot, Azar, Camelot Kitten, Converge, Dressed in Hermes, Frank Conversation, J R’s Holiday, Surgical Strike, Two Step Time. $250,000 PAT DAY MILE (GIII) (Entries taken Wednesday, race Saturday) – Probable: American Freedom, Cocked and Loaded, Discreetness, Forevamo, Imperial Hint, Lookin for a Kiss, Ralis, Sea Wizard, Star Hill, Unbridled Outlaw. CLICK HERE TO VIEW WORKOUTS AND GALLOPS BY KENTUCKY DERBY AND KENTUCKY OAKS CONTENDERS ON THE CHURCHILL DOWNS YOUTUBE CHANNEL.